These months, thanks to favorable geometrical conditions, we are enjoying mutual occultations and eclipses among the Galilean satellites. Some of these events are truly spectacular, as we showed the last time this conditions arose (2009). This time, there is another great coincidence: 2015 has been named International Year of Light (IYL2015) by United Nations, “[…] recognizing the importance of light and light-based technologies in the lives of the citizens of the world and for the future development of global society on many levels”. Quite interestingly, late in the XVII Century, the Galilean Moons were vital to make possible the first serious experimental determination of the speed of light. So, our event is perfectly on time! On 2 April 2015, starting at 18:45 UT, we will see live how Callisto will gradually cast its shadow to Ganymede, the largest moon in our Solar System. 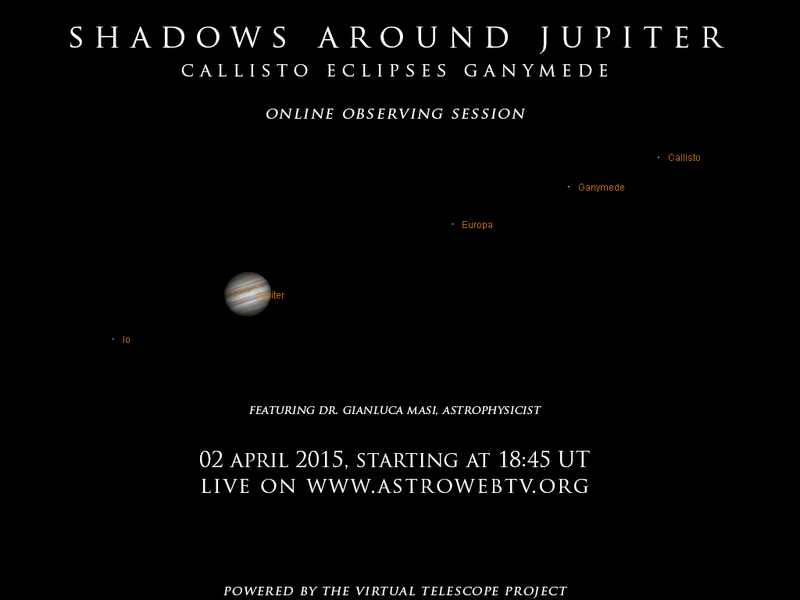 Join us on April 2, starting at 18:45 Universal Time! You just need to access our online webTV, click here!